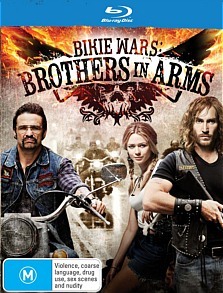 Bikie Wars: Brothers in Arms Review. ‘Brothers in Arms’ tells us that mateship and loyalty, those two quintessentially Australian ideals, can have a dark side. If the runaway success of shows like Underbelly are anything to go by, we Australians must love our crime-related dramas. Well now Network Ten has got in on the action, teaming up with production company Screentime to bring us Bikie Wars: Brothers in Arms. The show tells the story of the Comancheros motorcycle club, which is run out of western Sydney by blustery Scotsman Jock Ross (Matt Nable.) Jock and his men are out riding one weekend when they encounter a drifter named Spencer (Callan Mulvey.) Seeing something in the loner, Ross takes Spencer under his wing, and before long he is inducted into the club and given the nickname of ‘Snoddy’ Snodgrass. Snoddy’s intelligence and his powers of persuasion are enough to ingratiate him with the club, but they also lead to tension between himself and Jock. Alliances form, and the club splits into two separate chapters, with Snoddy forced away from his former friends. Confused and embittered, Snoddy takes on the colours of another club: The Bandidos. With hostilities between the two groups on the rise, it becomes clear that only one thing will settle the feud: A final and bloody showdown. The series takes a very stylistic approach to its storytelling, much like Underbelly and its numerous spin-offs. Slow-motion shots are used frequently, a thumping rock soundtrack accompanies the action, and the bikes themselves are shown in the most glamorous light. With these kinds of techniques, the producers always ran the risk of glorifying the horrible and criminal acts that took place, but thankfully this hasn’t happened. There’s plenty of violence on display, but no good is ever shown to come from it. Each and every one of the characters is well fleshed out. Even the most sadistic of them is shown to have a human side, and there are no true villains among the cast of characters. The real villain is pride. Pride is what forces the clubs apart, and what causes former mates to stare each other down before the final, bloody confrontation- a confrontation that none of them truly want. At it’s heart, Bikie Wars is a character drama, and it demands some strong performances from all of the actors involved. Matt Nable is totally convincing as Jock Ross, effortlessly displaying all of the conflicting sides of the character. But some of the fringe characters aren’t as good: Todd Lasance’s ‘Kiddo,’ for example, tries to convince us he’s a real bikie by looking permanently angry and putting on an artificially deep voice, but it doesn’t really come off. At 6 episodes, the series never outstays its welcome, but there are a couple of issues with pacing. Some story arcs, such as the relationship between Snoddy and Lee (Maeve Dermody) feel too spontaneous, and would have benefited from a longer germination period. Snoddy’s trip to America, whereby he meets with the Bandidos and sows the seeds of creating a new club in Australia, is all but glossed over. This is understandable given budget and time constraints, but you feel as if that crucial part of the story could have received a little more attention. Each and every shot is thoughtfully framed, and rich with symbolism or irony. Whether the camera shows flames reflecting in Jock’s glasses as he stares someone down, or a ’safety first’ sign that’s just been blown apart by a shotgun, there’s always something interesting happening on screen. In the end, the performances and attention to detail are enough to carry the show. The show takes place in a variety of settings and lighting conditions, from the searing midday sun in a quarry to the darkness of back alleys and nightclubs. The picture looks crisp and detailed throughout. Music is constant, and varied. Creepy sound effects are used during the more violent and shocking scenes, whereas the lighter moments are accompanied by rock anthems from the period. The Making Of: A short documentary which covers costume design, location scouting, and set design. All of the key actors speak about their parts and experiences with the show. Webisodes: A series of shorts, each delving into a different area of the production. A lot of this repeats in the ‘Making of’ documentary. ‘Brothers in Arms’ tells us that mateship and loyalty, those two quintessentially Australian ideals, can have a dark side. Some good performances and slick production values make this a series that’s big on style, big on heart, and with an important message to tell.